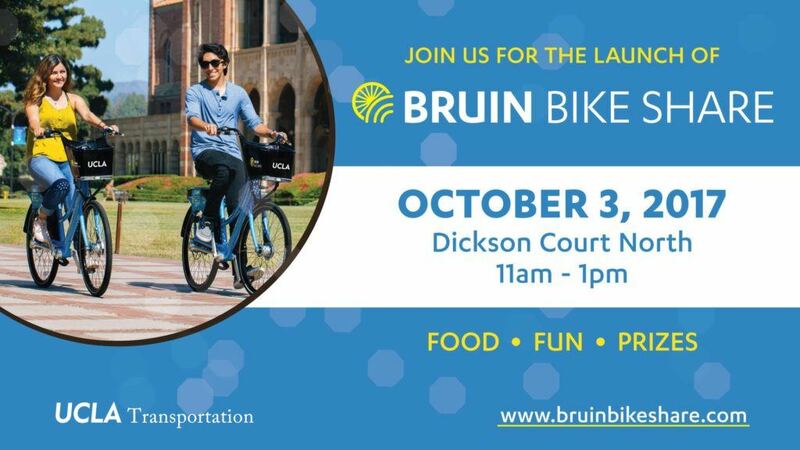 UCLA Transportation is excited to announce that Bruin Bike Share will be officially launching on Tuesday, October 3, 2017. Join us at Dickson Court North from 11 a.m. to 1 p.m. for the ribbon-cutting event with food, fun, prizes and giveaways! There will also be an inaugural group ride for a limited number of participants. Timed with the kick-off of Rideshare Month, Bruin Bike Share brings 130 bikes to 18 hubs throughout the campus and Westwood Village. UCLA students, staff and faculty will enjoy discounted membership plans to ride the bikes for quick, one-way trips. Run errands, cruise across campus, meet up with friends and more!